The full list of conference speakers and titles is now available! Speaker abstracts are here. 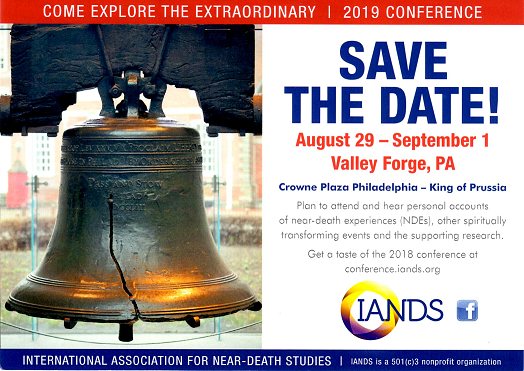 In addition to the Keynote and Plenary speakers, conference speakers include PMH Atwater, Jane Katra, Jim Macartney, Elke Macartney, Nancy Evans Bush and Jan Holden. Friday: PMH Atwater, Eben Alexander, Christophor Coppes, Pam Kircher, Debbie James. Sold out: Raymond Moody, Bruce Greyson. Saturday: John Audette (IANDS co-founder), Jane Katra, Nancy Evans Bush, Scott Olsen, Christophor Coppes. Sold out: Raymond Moody, Bruce Greyson. Register now and sign up for lunch with a speaker!